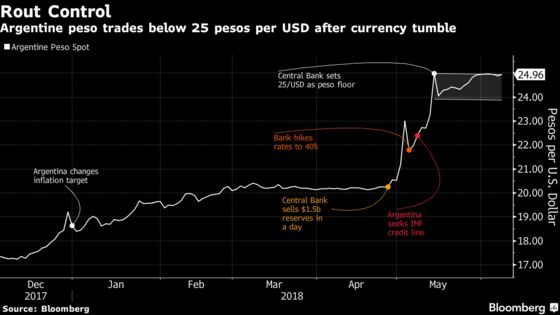 (Bloomberg) -- Three weeks after Argentina managed to stem a rout in its currency, and just as talks with the International Monetary Fund seem poised to bear fruit, some of Wall Street’s largest banks are weighing in with grim forecasts of more pain to come. Goldman Sachs Group Inc. cut its forecast for the peso, saying the embattled currency will slide another 13 percent this year even after losing a fifth of its value already. Morgan Stanley says Argentina will enter a brief recession in the second and third quarters, slashing its growth estimate for the year to an anemic 0.8 percent from 2.3 percent. It’s a far cry from expectations last year, when analysts and investors figured the economy would regain momentum after emerging from recession. Those hopes vanished when an unsustainable budget deficit and tumbling currency forced the nation to jack up interest rates to 40 percent and seek help from the IMF, the very institution whose austerity tactics many Argentines blame for its previous financial crisis. Yet Goldman says any IMF deal would just be a band-aid solution to the nation’s fiscal woes. “IMF financial assistance reduces the reliance on more expensive and less stable private market sources, but ultimately macroeconomic rebalancing demands a steadfast reduction of the fiscal deficit,” Goldman analysts led by Alberto Ramos wrote in a note. And Barclays Plc also says the peso may need to weaken further, as the real exchange rate depreciation probably isn’t enough to generate a quick correction of a current account deficit that the bank expects to stay above 4 percent of GDP during the next two years. The number could swell to 5.1 percent this year and 4.4 percent in 2019. Granted, Argentina has beaten back pressure on the peso in recent weeks, keeping it just below the 25-to-the-dollar level. And some analysts remain confident in the country’s economic team, which has been credited with facing other challenges such as removing capital controls and resolving a debt saga with holdout creditors. 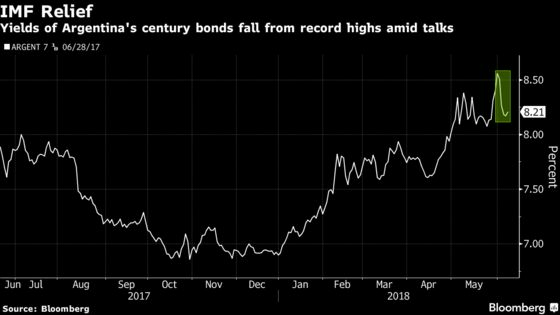 Nomura Holdings says Argentine bonds are cheap, citing a commitment by authorities to an IMF program as renewing positive investor sentiment. The peso traded at 24.97 per dollar at 1:11 p.m. in Buenos Aires. Still, Argentina must deal with a fiscal deficit and high public spending combined with low public income, wrote Mark Mobius, the veteran developing-nation investor who left Franklin Templeton Investments earlier this year, in a blog post published on his LinkedIn page. “Those two variables have already arrived and the confidence train has left the station,” he wrote.